I need another vacation. After working 10 out of 11 days, I’ve spent my three days off so far this week painting, cleaning, buildings, fixing, and scraping. I’m sore as hell, but it’s a good sore. Since we got most of the paint on the walls, we decided it was time to start moving our stuff. J wanted to sleep at our new place tonight and since we have TV, internet, and our new living room furniture, all we needed to do was move clothes and our bed and we’d have all the essentials. We woke up this morning at our apartment and immediately started loading our cars to make the first of two trips. After we unloaded that first trip, we started heading back, but first, we thought it would just work out well if we stopped and got lunch. Now that we’re on a new side of town, there are a lot of new places for us to try. I passed on a lot of those new places today because I just wasn’t feeling it. Instead, I opted for something I know and know I like. 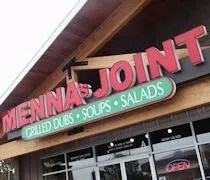 Menna’s Joint in Kalamazoo is on Stadium Drive right across the street from Wayside West and right next door to Sweetwater’s Donut Mill. I say I know Menna’s Joint yet I’ve never been to this location. 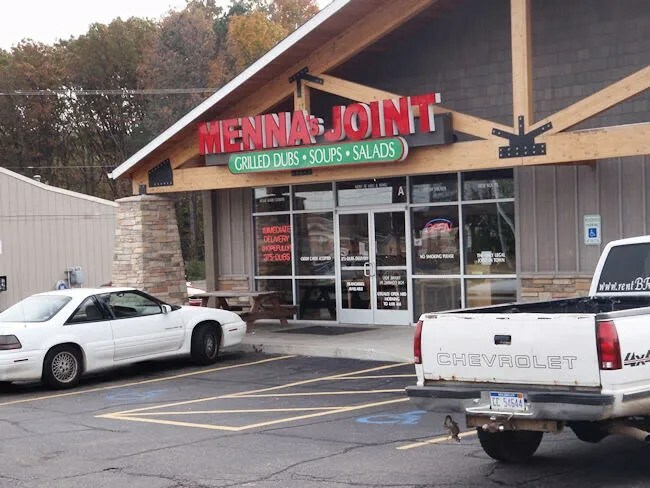 Menna’s Joint is actually an East Lansing staple. They opened their first store near the MSU campus in 2003 then added a second downtown location near the bars. They also opened a downtown Lansing location that didn’t really last. It’s now a pizza joint. They’ve also expanded to Mt. Pleasant near the CMU campus. Menna’s Joint has the reputation of being a late night stop…after the bars close. 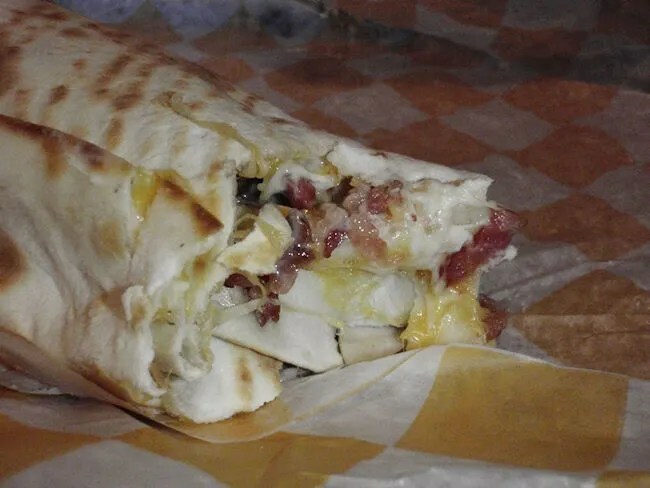 The Kalamazoo location is open until 4:00 AM and it’s not uncommon to see kids running across the street after Wayside closes to get one last meal before heading back to the dorms and contemplating how to deal with that hangover in the morning. J and I walked in a little after noon. There’s an order counter near the back of the space which is set up like most strip mall sandwich shops. You place your order at the far end of the counter then wait for your food to be made. It’s at this point I should probably introduce “The Dub.” The Dub is the staple of the Menna’s Joint menu. A Dub is basically a wrap. 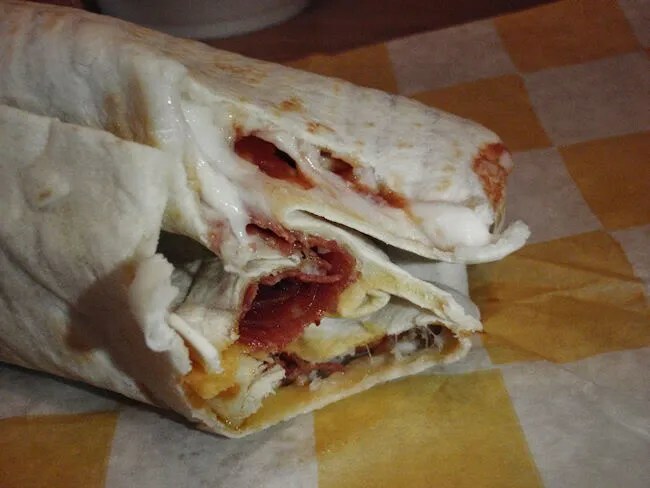 It’s a flour tortilla that is warmed on the flat top then filled with all sorts of interesting creations, wrapped up like a wrap and ultimately, eaten like a wrap. I wasn’t feeling super hungry at the time, so I ordered a 10″ MJ Special. The Dub is filled with chicken, pepperoni, meatballs, mozzarella, and marinara. The thing that separates Menna’s Dubs from a wrap is the fact that there is no filler. There’s no lettuce. No rice. No veggies. It’s all meat and cheese. Just the way I like it. My dub was loaded with the three meats and I got a little chunk of each in every bite. The 10″ was perfect for lunch. It’s not to heavy yet it’s still enough to leave satisfied. J went with the Loaded Dub. She also got a 10″ and it came filled with bacon, cheddar cheese, potatoes, mozzarella, ranch dressing, and sour cream. She was a little hesitant at first with the potatoes, but seemed genuinely happy with her choice. She mentioned that her Dub tasted like a baked potato rolled in a tortilla which is basically what the dub is. Instead of each getting a side of fries, we decided to get a large. I’ve eaten at Menna’s twice and I can’t recall if I have ever had the fries. Well, they’re not really fries. 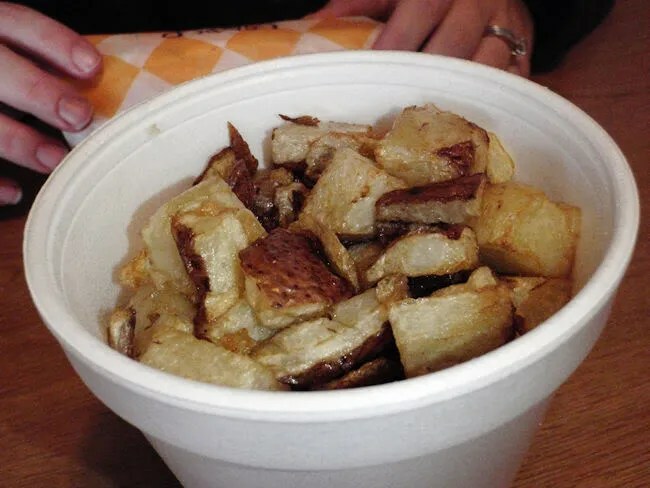 They are potatoes, but they are potato cubes that are deep fried. I found them much easier to eat with a fork and so did J. I know this sounds weird, but they had too much of a potato taste for me. I like my fries to taste like crunchy. They were good, but not really our thing. We didn’t even finish off the container before we left. Our bill was just a little over $13 and once again, Menna’s came through. I’ve been saving the Joint for some night when I needed a late night snack, but it’s always seemed too far to go to get food when I could just go to McDonald’s. That’s not the case anymore and I think we’ll be hitting up Menna’s more often now. It’s a fairly cheap meal, but still a quality meal. The fries by themselves are a bit boring like you said but when you order them loaded with cheese and bacon, they become much better, IMHO. I do like Menna’s, though their food has seemed inconsistent to me of late, at least for late nights. I’ve been ordering more Pita Pit lately, since it’s a similar concept but with a pita. BTW, apparently the Geno’s on Howard is morphing into something different. You may want to see what’s up.